EIC (exercise-induced collapse) is a recently recognised neuromuscular disorder of increasing significance in Labrador Retrievers, especially those dogs used for hunting and field trials. Recent research at the University of Minnesota has identified the gene responsible for the condition known as (EIC). 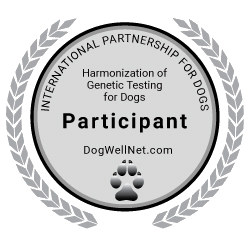 A mutation in the canine dynamin 1 (DNM1) gene is very likely to be fundamentally responsible for EIC. Due to Licensing agreements LABOKLIN can exclusively offer the EIC DNA test in Europe. The syndrome of Exercise induced collapse (EIC) is manifested by muscle weakness, incoordination and life-threatening collapse after intense exercise. Five to fifteen minutes of strenuous exercise causes dogs suffering from this condition to develop a wobbly gait, which soon progresses to nonpainful, flaccid paraparesis and a loss of control of the rear limbs. The episode may progress to all four limbs. Collapse episodes usually last for 5-10 minutes, and after 30 minutes there is often complete recovery, but episodes are occasionally fatal. The rectal temperature of dogs during an episode typically reaches 41.7°C (from a resting temperature of 39°C).